Kyle Grillot - kgrillot@shawmedia.com Customers Sue Wolfsmith, (from right) Christine Wolfsmith, George Terpska, and Sharon Terpska sit down for lunch Friday at Tropical Smoothie in Huntley. Owners Mike and Terri Ward have recently decided to give 100 percent of their profits to the Grafton Food Pantry in Huntley. Mike said he hopes they will be able to give out 6,000 meals throughout the year. 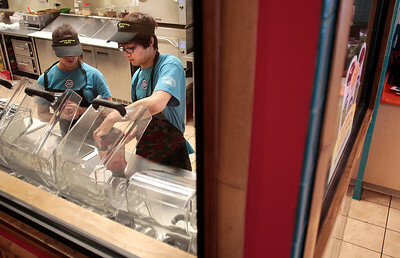 Kyle Grillot - kgrillot@shawmedia.com Tropical Smoothie employees Jen Vege and Michael Lou both of Huntley work on orders Friday, April, 4, 2014. Owners Mike and Terri Ward have recently decided to give 100 percent of their profits to the Grafton Food Pantry in Huntley. Mike said he hopes they will be able to give out 6,000 meals throughout the year. 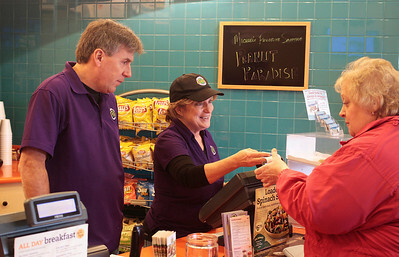 Kyle Grillot - kgrillot@shawmedia.com Tropical Smoothie owners Mike and Terri Ward help Vicki Gazda of Lake in the Hills Friday in their Huntley store. The owners have recently decided to give 100 percent of their profits to the Grafton Food Pantry in Huntley. Mike said he hopes they will be able to give out 6,000 meals throughout the year. 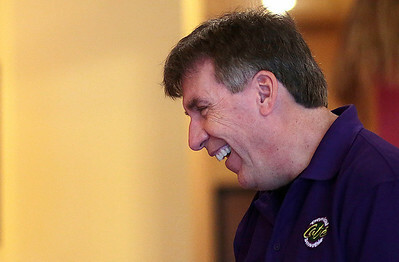 Kyle Grillot - kgrillot@shawmedia.com Tropical Smoothie owner Mike Ward talks with customers Friday in the Huntley store. The owners have recently decided to give 100 percent of their profits to the Grafton Food Pantry in Huntley. Mike said he hopes they will be able to give out 6,000 meals throughout the year. 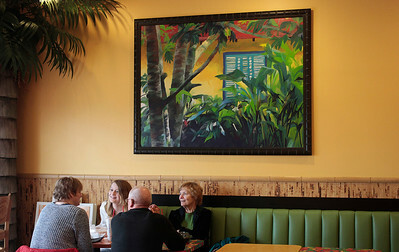 Customers Sue Wolfsmith, (from right) Christine Wolfsmith, George Terpska, and Sharon Terpska sit down for lunch Friday at Tropical Smoothie in Huntley. Owners Mike and Terri Ward have recently decided to give 100 percent of their profits to the Grafton Food Pantry in Huntley. Mike said he hopes they will be able to give out 6,000 meals throughout the year.